We went to a town in a mountain of Kyoto to attend to the workshop organized by a friend of mine who is designing and producing furniture. Yes, we love traveling and going out very frequently, but those are including business trips and taking a short walks around the town if we could. Anyway, the workshop was to make a stool from a log with using tools which we can only chop and curve. The workshop ended at 7pm although it started from noon. We left all the things behind and just concentrated chopping, curving and knitting during the workshop. Although sadly it was rain and I was wet and shirt and pants were covered by the chips of woods, I didn’t mind them and the sky turned dark when I noticed. I was believing the good way of refreshing yourself is to have a travel and look at the great views or sunset with relaxing yourself and I still believe it. 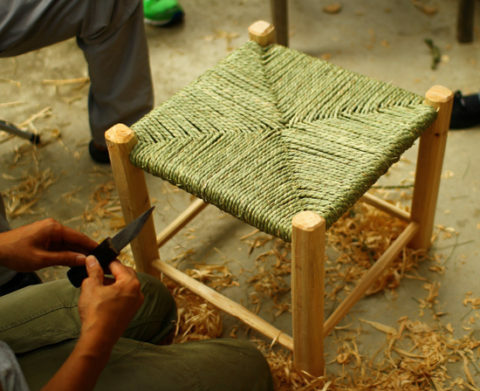 But on this workshop, everything in my mind was gone and the mind was filled with something not there before the workshop and fully concentrating only for making the stool. When I done it, daily matters come back to where they were but the brain itself is no longer the same brain as it was. It is like a colonic irrigation which clear and wash your brain and this experience taught me, or let me say reminded me this is absorbed myself in something, which I forgot for a long time. I said to the friend “How wonderful and bracing to make things by your hands!”. Photo: The stool made from a log.